Freshly made ice at home when you want it. A little bigger than the standard model, this brushed stainless steel Contessa is a self-contained ice maker, portable, yet stylish and requires no drain. You can get up to an ice cube every minute in 3 different sizes and the machine will continue to make ice while there is water in the tank and it is switched on. Should the ice drawer fill up, the Contessa automatically goes into 'sleep mode' and resumes as soon as some ice has been removed from the drawer. 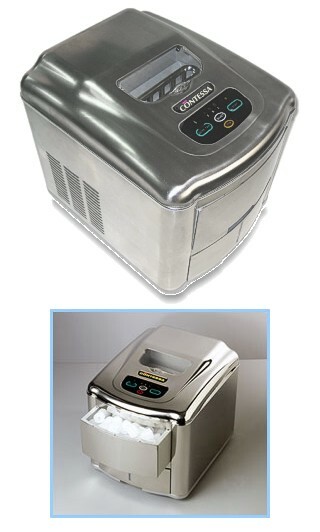 Ideal for home, leisure and the office it will make 1kg ice in 80 mins (in appropriate conditions) or approximately 16kg ice per 24hrs. This robust mains powered unit measures 36 by 39 by 44 cm (14 by 15 1/2 by 17 1/2 inches approximately) with an extra large 1.2 Kg ice drawer capacity and 4.5 litre water tank.